When I think of summer desserts, cheesecakes are always the first to spring to mind, and this is a delicious one that I've made a few times that my family adore. It goes perfectly with some fresh summer berries too! Cream together the butter and caster sugar in a bowl then gradually add in the 2 eggs followed by the flour, cocoa and salt, combining it well. Spread the mixture out evenly into a lined baking tray (9" x 12" approx) and place it into the fridge for 40 minutes to set. Bake for 25-30 minutes then allow to cool (do not remove from the tray). To make the topping, melt the chocolate in a bowl above boiling water and then allow to cool slightly. 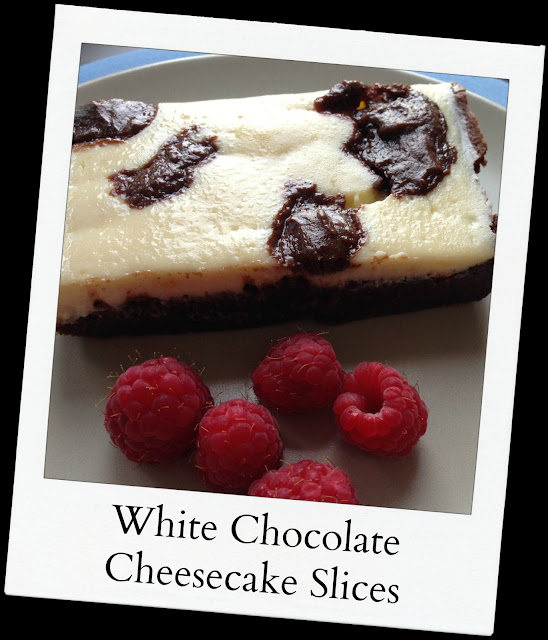 Mix the cream cheese with the icing sugar and egg then pour in the melted chocolate, combining well. Spread the topping over the base and bake for 25 minutes/until set. Remove from the oven, allow to cool completely then chill in the fridge for 2 hours. Slice the cheesecake into 12 equal rectangles and store in the fridge. To create a spotted look, save a small amount of the base mixture in the fridge and then crumble it on top of the topping before it is baked. Immediately Pinned to try later. Looks amazing, I love cheesecake! love the last part of the method! OMG I am drooling! I love white chocolate! We made these yesterday and really enjoyed them in the garden! Thank you! Wowzers, that looks fabulous. Can you deliver?! That looks absolutely delicious, must try it. We're all fans of white chocolate. Oo, these look sooo nice. Cool thanks! I have a few eggs that need to be eaten so I might follow your recipe today to use them up! Looks so yummmy! A hundred times better than shop bought. Mmmmm Cheesecake has got to be my favourite dessert and this sound lovely! I made these a while ago. I wasn't too keen on the cream cheese bit but I think I could get used to the taste! These sound delicious. I'll have a go. It sounds like a simple recipe.